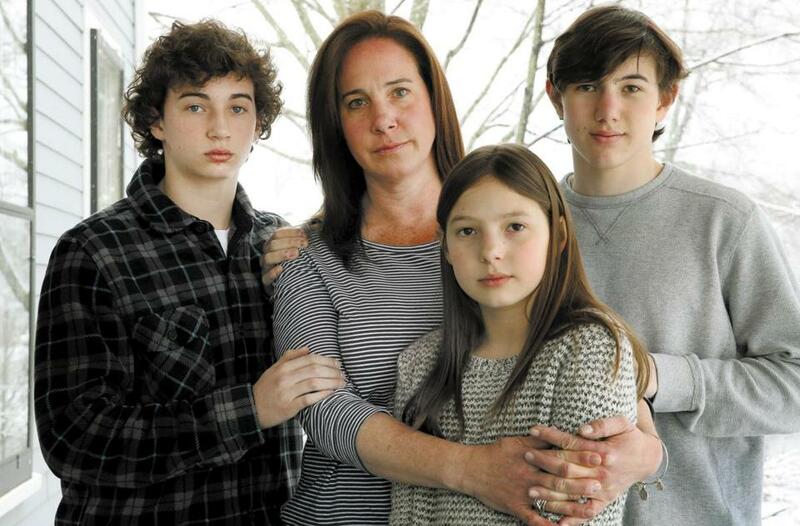 Alexis Weisz (second from left) posed with her children (left to right) Maxwell, 13, Grace, 11, and Logan, 16, at their home in Bedford. Weisz’s husband, Christopher, was struck and killed last year, allegedly by a driver with past drunken driving convictions. The first person to call 911 warned that a driver was “all over the road” during morning rush hour, her head bobbing up and down as if, the caller said, she was on drugs. Yet when Trooper Daniel Hanafin arrived at the crash scene on Route 3 in Burlington that morning last August, he observed no signs of impairment and let the driver, Lynn DeWolfe, 51, a twice-convicted drunk driver with a long record of violations and a breath-test device installed in her car, drive away. Nineteen minutes later, DeWolfe struck another car, according to police, triggering a second crash that killed motorcyclist Christopher Weisz, a 42-year-old Bedford man on his way to work. DeWolfe, of Tyngsborough, now faces charges that include driving under the influence of drugs. As her case cycles through the criminal justice system, records point to a series of missed warning signs on the road to tragedy and raise questions about how she could ever have been allowed to proceed after Hanafin stopped her, why the trooper who took the 911 calls didn’t act more urgently, and why the State Police have done so little to investigate since. The agency quietly conducted an internal investigation which concluded that Trooper Hanafin — the son of a retired lieutenant colonel — didn’t have probable cause to arrest DeWolfe, but should have written a report about the earlier crash, records show. But for eight months the State Police didn’t tell prosecutors about the 911 calls and withheld details of Hanafin’s fateful decision, according to the Middlesex district attorney’s office. Police also never told Weisz’s widow about the earlier crash — she learned about it from the Globe. DeWolfe had a history of drunk driving, refusing breathalyzers, speeding, and crashes spanning 30 years. Just last June, she collided with a motorcyclist on her way to a Registry of Motor Vehicles hearing, records show. But this time the consequences were deadly. A husband and father of three was dead. State Police spokesman David Procopio said the department found that Hanafin, a four-year veteran of the force, “took all appropriate steps” to determine whether DeWolfe was impaired. Hanafin’s attorney, Daniel Moynihan, called him an “excellent trooper” and said he observed DeWolfe walking and talking and saw no evidence that she was impaired. “A trooper can only arrest somebody when he has probable cause, and he did not have probable cause,” Moynihan said. Asked whether Hanafin took the earlier 911 calls into account, Moynihan said the two reports of erratic driving still didn’t give the trooper probable cause. In August, DeWolfe pleaded not guilty to charges that include operating under the influence of drugs, leaving the scene of an accident resulting in personal injury, and negligence. Her attorney, Arnold “A.J.” Blank, declined to comment. Neither DeWolfe nor the driver who struck Weisz has been charged with his death. As of last week, eight months after the accident, State Police said they were still working on an accident reconstruction report, trying to piece together what occurred on a stretch of highway on that partly cloudy summer day. On the morning of Aug. 24, Christopher Weisz — Boy Scout leader, Little League coach, and go-to neighborhood fix-it man — was easing back into his weekday routine. He and his wife and their children — Logan, Maxwell, and Grace — had just returned from a vacation in Oregon, where they had watched the solar eclipse. He hopped on his recently restored 1987 BMW motorcycle and headed to his IT engineering job at Al Foundry in Wakefield. Lynne DeWolfe woke up at 6 that morning at her boyfriend’s house in Tyngsborough. She put on her bathing suit, a cover-up, and flip flops, and prepared for a trip to the beach, according to police reports. She later told police that before heading out she took two prescription medications — 0.5 mg of Lorazepam and 300 mg of Gabapentin. Lorazepam is typically used to treat anxiety. DeWolfe said she took Gabapentin, a pain medication, for a back injury. At about 8 a.m., she climbed into her silver Saab. She had to blow into a straw connected to an ignition interlock device, which detects alcohol — but not drugs — on the breath. The engine starts only if a driver’s breath is alcohol-free. This practice was routine for DeWolfe. She had been convicted of drunken driving in 1987 and 2005, and was stripped of her license for 10 years, according to Registry of Motor Vehicles records. In order to get her license reinstated in 2015, DeWolfe was required to equip her car with the device. After a puff of breath, the engine started, and DeWolfe made her way onto the road. Sometime before 8:30 a.m., Eric Carlson spotted a Saab flying up behind him on Route 3 South in Chelmsford. DeWolfe, according to records, was behind the wheel. She drove too fast, then too slow, then in and out of lanes, stopping just shy of his bumper, Carlson told the Globe. Her manner was not aggressive but “dopey,” and she didn’t seem to have control of the vehicle, he said. Carlson called 911, offered details on DeWolfe’s car and license plate, and said he thought she might be on drugs, according to police reports. He told a dispatcher her head was bobbing up and down. Trooper Michael Benevento took that call but did not broadcast the warning over the police radio system. It was a busy morning, he later told State Police investigators. “I feel he did not take it seriously at all,” Carlson told the Globe. Carlson said Benevento suggested to him that the erratic driver might have been texting while driving. DeWolfe continued on Route 3. At 8:55 a.m., another motorist called 911 to report that DeWolfe sped up to his bumper twice in stop-and-go traffic then slammed into him. He said he’d tried to exchange accident paperwork with DeWolfe, and got the impression she was under the influence of drugs, according to police reports. She was irate and appeared “out of it,” according to the motorist, whose identity was redacted from police records. This time, Benevento dispatched Trooper Hanafin and alerted him via text message about the erratic driving call minutes earlier, according to the reports. At the scene, DeWolfe told Hanafin that the other car had backed into her while she was stopped on the highway. She insisted she hadn’t drunk any alcohol or taken any drugs, according to police reports. She refused to take a field sobriety test and requested a lawyer, according to the reports. In Massachusetts, drivers automatically lose their license for a minimum of 180 days if they refuse to take a breathalyzer, but there’s no penalty for refusing to take a field sobriety test. Donald Decker, a retired Marblehead police officer and coordinator for the state’s Drug Recognition Expert program, said officers can find probable cause even without a field sobriety test. They can arrest the person or call an ambulance if the person appears to be suffering a medical issue. Hanafin told investigators he had DeWolfe blow into the ignition interlock device. She puffed into the machine and started the engine, and he concluded she wasn’t drunk. Next, he said, he administered a horizontal eye test, requiring her to follow his finger with her eyes. At 9:14 a.m., DeWolfe was cleared to go. Nineteen minutes later, some eight miles away, DeWolfe, according to police, crashed into a car driven by an 85-year-old Natick woman. The woman’s car struck a jersey barrier, spun around, and veered into oncoming traffic on Interstate 95 North in Reading, striking Weisz’s motorcycle and hitting two other cars, according to police reports. DeWolfe drove away, striking more cars and triggering additional 911 calls before getting stuck in the median in Wakefield, police said. When police ordered her out of the car, she staggered and lost her balance, had difficulty focusing, and was unable to recall what month it was, according to reports. Immediately, officers noted that DeWolfe wasn’t acting right. Her eyes were “droopy” and her speech thick, according to reports. Police arrested her and brought her to the Danvers barracks. There, a trooper trained as a drug recognition expert evaluated DeWolfe and concluded she was impaired, reports show. She was held overnight and pleaded not guilty the following day to charges. As DeWolfe’s new criminal case wended its way through court, State Police commenced an internal investigation into Hanafin’s and Benevento’s actions. For eight months, the agency shared few details of that probe with prosecutors. Kelly said prosecutors repeatedly requested all details and reports from the incident, but State Police “responded they could not release those documents while conducting their Internal Affairs investigation.” State Police eventually turned over the materials on Tuesday, weeks after the Globe contacted Weisz’s family and requested records from police. Howard Friedman, a civil rights lawyer who specializes in police cases, called it shocking that police failed to immediately turn over all information to prosecutors. “To say we are not going to give you our reports because we are investigating our own people, that’s just not the way it works,” Friedman said. In October, State Police found Hanafin violated regulations for not writing a report, according to heavily redacted reports provided to the Globe. The department also sustained complaints of misconduct and unsatisfactory performance against Benevento for failing to broadcast or log the 911 call about DeWolfe’s alleged erratic driving. Both troopers were docked a day’s pay. Hanafin’s lawyer told the Globe that Hanafin wasn’t obligated to write a report about the earlier crash because nobody was injured and he estimated damage to the vehicles was less than $1,000. Left to raise three children alone, Alexis Weisz has one simple question: Why didn’t anybody take DeWolfe’s keys away? The Registry of Motor Vehicles had been monitoring DeWolfe’s compliance with the ignition interlock device since she got her license back in May 2015, records show. Records show that in March 2017, she failed two startup tests — registering blood alcohol concentration levels of .043 and a .033. Two months later, she failed a startup test by registering an alcohol level of .142. Then on June 20, 45 minutes before an RMV hearing officer would consider her recent violations, DeWolfe collided with a 21-year-old motorcyclist on Interstate 95 in Woburn, records show. No citations were issued, according to a State Police report, and DeWolfe drove away. Minutes later she was at the Registry, where a hearing officer found that DeWolfe “has a very good record,” except for the two failed ignition breath tests in March. The one failure in May didn’t qualify as a violation under the law. The hearing officer, who didn’t have legal authority to revoke DeWolfe’s license, extended the requirement that she use the interlock device program until later in the year. Two months later, she’d crash her silver Saab again. Shelley Murphy can be reached at shelley.murphy@globe.com.